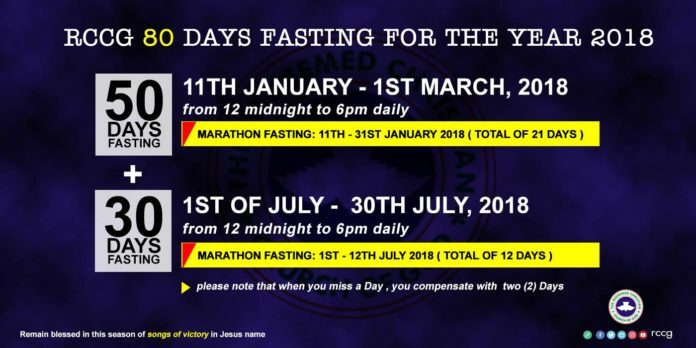 The Redeemed Christian Church Of God (RCCG) has released prayer topics for the 80 days prayer and fasting which is to commence on Thursday 11th January 2018. If you will be fasting without breaking, the first period of fasting can be done for 21 days and the second period can be done for 12 days. Psa150:6 Let everything that hath breath praise the LORD. Praise ye the LORD. PRAYER OF FORGIVENESS: Text: Matt. 18:22 Jere. 31:34; LUKE 23:34, 1kings 13:1-6; Act 7:54-60, John 3:16. Your lack of forgiveness can sabotage your comprehensive victory. Since no one can offend you Seventy times, therefore, learn to forgive so that your fasting and prayers can be acceptable before God. Your waiting on Him will never amount to an hunger strike. Amen. Thank God for Daddy and Mummy G.O and for what God is doing through them. PRAYER FOR BREAKING GENERATIONAL SINS, SOUL TIES AND CURSES: Text: Rom. 5:15; Exo. 20, 34:5-7, Eze 18:19. Thank God for the family of Daddy and Mummy G.O and for His mercy on them Exod. Let us thank God for His new move in raising a New Army of vibrant youths in RCCG . Father; let me under the covering of your shadows. Father; let your angel encamp around me in all my ways. Pray for them anointing, compassion, revived prayer life, healthy family life, fruitfulness, grace and favour. Ask the Lord to send more (Labourers) missionaries to un-reached people groups. Matt 9:3738, Mk.16:15. Pray there shall be harvest of miracles for you and all yours this year. Pray that there shall be harvest of Miracles at every sphere of your lives this year. Father!!! By the power in Your word through daddy GO and in all ministrations let there be signs, wonders and harvest of souls. Father!!! Every power sabotaging my comprehensive miracles of victory, stumble, fall and die now!!!!!! Let us come against every spirit of distractions that divert people attention away from the point of blessings. Pray that every problem that are designed to crippled the destinies of any RCCG members will receive divine solutions in the name of Jesus. Destroy arrows of unbelief fired to hinder miracles in our life this year in the name of Jesus. Miracles associated with the first month that is yet to happen in my life: hear the Word of the Lord: MANIFEST NOW BY FIRE!!! in the name of Jesus. Father give us outstanding miracles that will magnetize multitudes into our churches this year in the name of Jesus. I plead the blood, the blood of Jesus. Thank God the author and finisher of your faith. O! Lord my father, let the four winds of the earth begin to blow in FAVOUR, of all the camp projects in Jesus name. Father scatter every conspiracy of Hell against the completion of 3×3 Auditorium, in Jesus name. The new Auditorium project, arise and shine in Jesus name. Isa 60:1 – Attract resources and finances in Jesus name. Gain unusual speed in Jesus name. Reject wrong workers in Jesus name. Reject the voice of abandonment in Jesus name. Receive grace and fresh anointing in Jesus name. Be surrounded with the wall of fire in Jesus name. Receive the light of God in Jesus name. Pray that the Holy Ghost alone will LORD over all the RCCG programs from start to finish. Pray for Divine provision for all the programs. Haggai 2:8. PRAYER AGAINST SATANIC ALTAR: Text Number 22:6; 23:1-2. An Altar is a place of sacrifice. It is a place where man makes contact with the spirit world either good or bad spirits. It is a place of covenant initiation, invocations and service. Covenant requires constant serving either by regular maintenance or activating of a dormant covenant. This knowledge is to awaken the sleeping Christians who desire to fulfill a glorious destiny to rise up and fight a good fight of faith in order to secure his/her destiny from the hands of the wicked and saboteurs. I refused to be a prisoner of any local altar, in the name of Jesus. I render every aggressive altar impotent, in the mighty name of Jesus. I withdraw my name, blessing, breakthrough, prosperity and anything representing me from every evil altar, in the name of Jesus. Retreat with God: Pray for them to take personal prayer retreats to get their direction from Him. Let us pray that God will fortify the strength of Daddy and Mummy G O. Isa. Ask God to fortify Pastor E.A. Adeboye more with His Ultimate Power. Pray for the global church to be bold as it speaks out for governments to respond. Pray for governments across the world to take the urgent and ambitious action needed. Let us thank God for the Men of honour inspire by the Holy Spirit to move Nigeria forward continually by praying Ps. 37:37, Ps. 125:1-3. God will hear our prayer and recovered our nation from recession and all forms of famine. God to put an end to terrorism, kidnapping, hired killing, corruption, militancy, communal clashes, Farmers and herdsmen clashes in the land. 1.2Ki_19:34 For I will defend this city, to save it, for mine own sake, and for my servant David’s sake. 2.Isa_38:6 And I will deliver thee and this city out of the hand of the king of Assyria: and I will defend this city. Father save us from kidnappers, ritualists and cultists in Jesus’ name. Father expose all kingpins of cultism and kidnapping in Nigeria. Lord set confusion in the camps of ritualists, kidnappers and cultists. We decree and declare Nigeria free from kidnapping, rituals and cultism in Jesus’ name. My father haven crushed poverty let me be receiving alerts throughout this year 2018. We declare health, comfort and strength to every sick person in the hospitals and homes in Jesus’ name! We come against every form of accident in Nigeria and abroad be it air, road or rail etc. Let every blood sucking demon on our highways be put to Shame this year 2018! We declare the land, the air and waters safe for every journey in Jesus’ name! Father!!! By fire by force, break into pieces every stubborn mountain in my life today. Pray all manners of prayers of thanksgiving and praises for all He has done. Appreciate God for answers granted to all our prayers in this first lap. Pray all manners of prayers of thanksgiving and praises cement all He has done AND WHAT HE WILL DO for you. Thank God for giving you comprehensive victory already.